(Data were normalised to 100% in 1970, and subsequent trends plotted using the software Statistical Package for the Social Sciences. Data are from the WHO-HFA database.4 Analysed by Nick Sheron September, 2013). 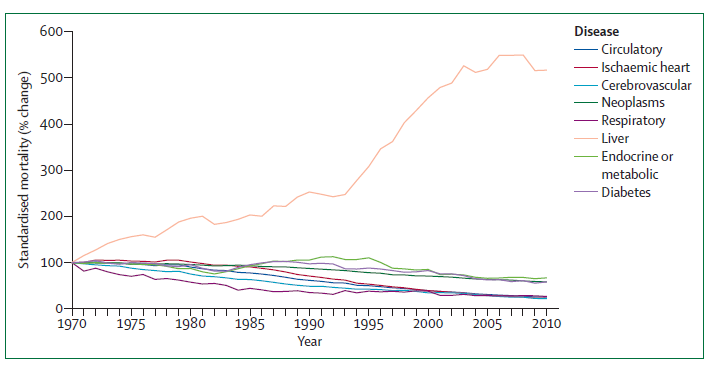 16,087 people in the UK died from liver disease in 2008, a 4.5% increase since 2007. Liver disease kills more people than diabetes and road deaths combined. These statistics are not comprehensive, due to two major reasons for under recording: the stigma associated with liver disease and attempts to avoid distress to the bereaved, and attribution of liver deaths to other codes as liver disease frequently causes multiple organ dysfunction. It is important to remember that as people can survive with 70% liver damage, there is a substantial burden of morbidity from liver disease, a high cost to the NHS and a huge economic and human cost from liver-related ill health. British Liver Trust analysis of official mortality statistics covering all deaths related to liver dysfunction covering ICD K70-76 and other codes including C22-24 (liver cancer), and B15-B19 (viral hepatitis), December 2009. The process is silent, but when liver disease has developed it presents as an acute illness with a 25-50% immediate mortality. North West Public Health Observatory (2008), ‘Local Alcohol Profiles for England’. Hepatitis B is one of the world’s most common and serious infectious diseases and the most common liver infection in the world. In England and Wales, new hepatitis B notifications to the authorities increased from 487 in 1992 to 1,151 in 2003 - a 135% increase. Collecting data for hepatitis B in the UK is under review but 600 to 800 new cases of acute hepatitis B are recorded each year. 5 However, most infections are not diagnosed at the acute stage and many chronic carriers are unaware of their infection. There are approximately 1,300 cases of symptomatic acute cases of hepatitis B each year, however approximately two-thirds of hepatitis B cases are asymptomatic, which means many cases are often undiagnosed leading to under-reporting of the disease. HBV can survive in excess of a week in dried blood e.g. blood stains on table tops and razor blades. The number of new laboratory confirmed diagnoses rose to 7,540 in 2007, 12 per cent higher than the number of new diagnoses in 2006. 4 Only a small proportion of total infections are thought to be laboratory-confirmed, as the majority of people are unaware of their infection and are not tested. The World Health Organisation (WHO) reports that approximately 3% of the world’s population are infected with hepatitis C. 170 million people are chronically infected and 3-4 million are newly infected each year. Freeman AJ, Dore GJ, Law MG, Thorpe M, Von Overbeck J, Lloyd AR, et al. Estimating progression to cirrhosis in chronic hepatitis C virus infection. Hepatology 2001;34(4 Pt 1):809-16. At the end of March 2009 there were 338 people registered for a liver transplant. From 1st April 08 to 29th March 2009 there were 644 liver transplants from deceased donors. In 2007-8, 268 people remained on the active waiting list. There were a total of 1,121 patients waiting on the list during 2007-8. 58% of these received transplants while 25% were still waiting at 31st March 2008. Between 2002 and 2007, there were a total of 3333 liver transplants including liver/kidney, liver/pancreas and lung/liver operations. The top three causes were alcohol related cirrhosis (527), hepatitis C related cirrhosis (412) and primary biliary cirrhosis (281). Please see our transplant section for further information. The cost to the NHS is estimated to be £4.2 billion and will be double that by 2050. The Health Survey for England (HSE) data shows that in 2007, 60.8% of adults (aged 16 or over) in England were overweight or obese, out of these 24% were obese. Both obesity and type 2 diabetes have been seen as being global epidemics. Obesity is not only associated with NAFLD/NASH, but with progression of hepatitis C and of alcohol related liver disease. NAFLD is considered to be the most common liver problem in the western world with 20-30% of the population affected, the vast majority undiagnosed.